Hi there, Lily Bee fans! Welcome to my blog!! 2. I used a soft gray ink (attic dust by Prima) to ink the edges of every piece. 3. Stack the three circles and place on the bunny bum. Add a staple to the center(ish)…it doesn’t have to be perfectly centered. 4. Fold the circles up toward the center and then fan them out to make a puffy tail. 5. Use a 1/16” hole punch to add holes to each ear. String baker’s twine through each ear (I used a flosser as a “needle”). 6. Add all of the bunnies onto the twine and hang them up! Wendy Sue Anderson <----that’s me! 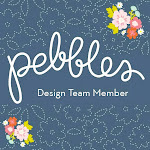 Now be sure to head back over to the Lily Bee blog for a chance to win some Lily Bee Design product of your own! This is absolutely adorable! Will be making for next year, my kids will love it! This is soo adorable! Love the step x step photos! Welcome to the team! I'm so excited to be designing with you! Awwww, what a great idea! I love their little tails! LOVE, LOVE, LOVE it, Wendy!! Love that I can do this quickly TODAY! And, great idea for other holidays! Adorable banner!! Thanks for the great step-by-step photos! I hope that you don't mind me stealing your idea. I LOVE IT!!!!!!!!! This is just too adorable! Love those bunny tails! I LOVE THIS!!!! Serious cuteness going on here! Love that cut file and how you made the bunny tails! Oh my, i really love this. Do I have time to go put this together for company on EAster Sunday?? Love those bunny tails! And with your quick tutorial, even I can create them. So sweet!!!! SO cute!! Love the "bunny bums" adorned with 3D paper tails! Such a quick and easy project - thanks so much for sharing this adorable banner idea! What an adorable garland1 The bunny tails are so cute! Thanks for sharing! How cute! Love the bunny tails! ahhhh this is so cute!!! I LOVE love love the tails! What a great banner and those bunny tails are genius!! This is "simply" the cutest bunny garland I have ever seen!!!! I love it so much I think I am going to have to make one for my granddaughters!!!! It's so adorable!!!!! Oh, your tails are so perfect. What a cute banner. Great step by step instructions. Thanks for making it seem easier to make the cute tails on these super cute bunnies. Beautifully done and so greatly appreciated!! So cute! Those 3D tails really make it special! Oh wow! That is too cute! Love it and yes, I need a Cameo! I just love those fun tails! What a great way to add a whole lot of wonderful to your banner! TFS! I don't think I could make these any cute! I LOVE these!! So glad to be on the team with you!